This cabinet card portrait features a well dressed gentleman wearing a huge mustache. The mustache is joined with his sideburns. To see other amazing mustaches, click on the cabinet card gallery’s category of “Mustaches (Only the Best). The photographer of this facial hair extravaganza is D. B. Millard. He operated a studio “Over the Post Office” in Scranton, Pennsylvania. His cabinet card price list can be seen on the reverse of this photograph. The cost of a cabinet card was $3.00 but volume buyers could purchase a dozen photographs for $1.50 each. The internet resource, Langdon Road, reveals that Millard owned Millard’s Gallery, at 314 Lackawanna; in the city of Scranton. His obituary appears in the “Photographic Times and American Photographer” (1891). The article labels him as the best and most popular photographer in Scranton. The obituary notes that Millard died of heart failure after a short illness. Millard’s name appears in Scranton’s business directories from at least 1879 through 1888. Other directories list his name as “Durand B. Millard”. This cabinet card portrait is in very good condition (see scans). This vintage photograph features a young boy wearing night clothes deep in prayer. He has a far away look as he kneels and looks toward heaven. The photograph was taken by the Schriever studio in Emporium, Pennsylvania. The reverse of this photograph has an inscription with the name of the subject “James Speltz”. The name is difficult to decipher and I may be incorrect about the exact name. The inscription also reveals that the photograph was taken in 1897. James Beniface Schriever (1868-1943) was a noted Pennsylvania photographer. He began his career in 1888. His original gallery was in the town of Kane. In 1890 he took his talent and went to work in Emporium. Between 1900 and 1937 he conducted his photography business in Scranton, Pennsylvania. Wilson’s Photographic Magazine (1900) announces the opening of Schriever’s Scanton studio and it appears that he was a talented in marketing. Music was played at the opening and invitations were sent to the public in the form of a legal summons. In 1900, Schriever was the President of the Pennsylvania Photographers Association. He was a 1906 member of the Scranton Board of Trade. He is reported in a “Rootsweb,com” entry to have photographed more than 130,000 people in Scranton during his career. He trained his nephew William G. Bair in the art of photography and sold the business to him in the early 1900’s. The business became known as the Bair Photo Studio. It burned down in the 1930’s. Schriever was also noted for his founding of the “American School of Art and Photography”. The school was actually a correspondence school that utilized the “Schriever System” to teach photography by mail. The course was entitled “The Complete Self Instructing Library of Practical Photography” (1908). Schriever apparently was an innovator and an entrepreneur.The cartoon below is a caricature of J. B. Schriever from the book “The Story of Scranton” (1914) by Bill Steinke. ADDENDUM: A visitor to this site left a comment that led to the likely identification of the child seen in this photograph. The commentator skillfully deciphered the inscription and posited that the name written is “James Keltz”. Research revealed that a James DeCoudrey Keltz (1888-1953) lived in Emporium and nearby communities his entire life. The 1910 US census reported that he was working as an apprentice mechanic in a factory. His World War I draft registration papers revealed that he lived in Emporium. The 1920 US Census found him living in Shippen. He was married to Nancy Miller who was nine years his junior. They were married in 1918. He was working in the coal mines and the couple lived with his parents. The 1930 US census found Keltz living in Canton and working is an enamel room of a hanger factory. He died in 1953, at age 65, and was survived by his wife. His death certificate indicates that he died from “Circulation Black Pulmonary” disease due to asthma. It is my hypothesis that he died from Black Lung Disease related to his working in a coal mine in his younger days. 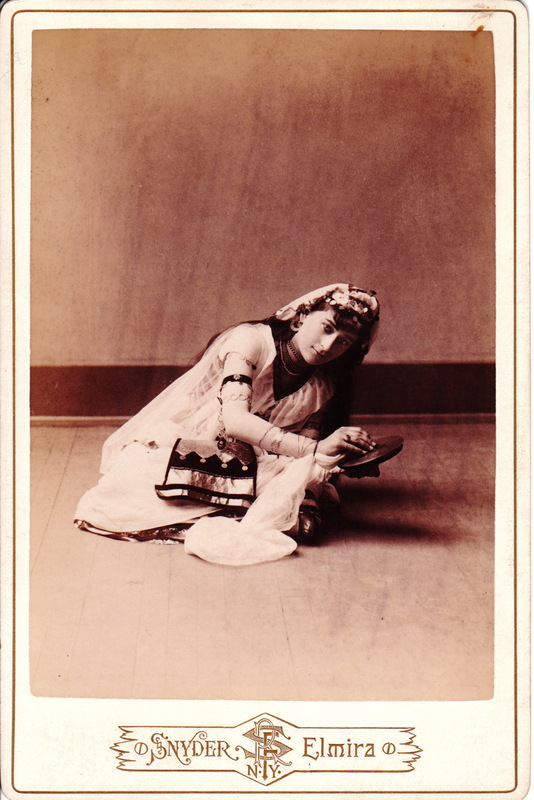 R. F. Snyder of Elmira, New York produced this cabinet card photograph of a young gypsy woman. One can not be certain whether this image displays a young gypsy woman, or a young woman dressed to appear as a gypsy. She is wearing the appropriate ethnic clothing and is holding cymbals. The reverse of the photograph has a copyright date of 1889. 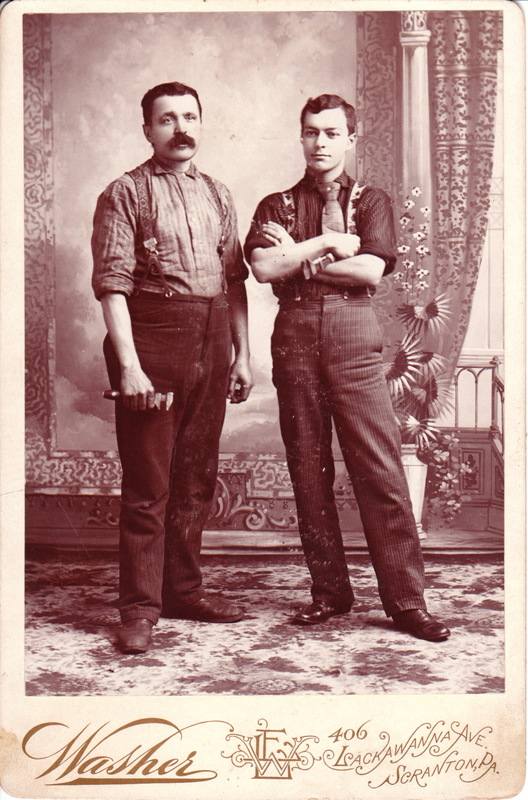 This cabinet card does not represent good quality posing skills on the part of the photographer. The subject was photographed at too great a distance and she is consumed by the large blank expanse of the floor beneath her and the wall behind her. Ralph F. Snyder was born about 1852 in Berwick, Pennsylvania. His father, John Snyder, was a photographer. Ralph Snyder began his photography career at age 18 and soon had a studio in Scranton, Pennsylvania (1873). He also worked in Philadelphia before coming to Elmira, New York to open his gallery. His studio in Elmira was located at 116 Baldwin (1891). 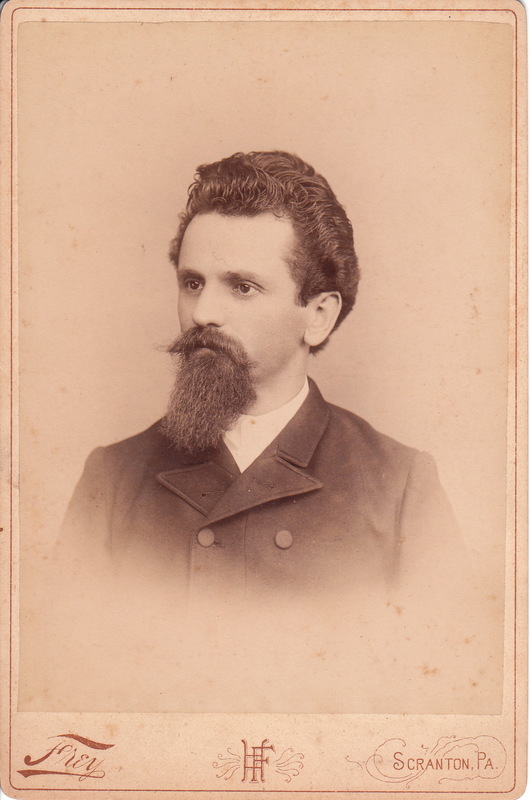 This cabinet card features a young man with an interesting beard and an abundance of hair atop his head. He isn’t the former President of the Hair Club for Men but his natural hair is styled in such a way to give an appearance of a hairpiece. The photographer is Henry Frey of Scranton, Pennsylvania. The studio was located at 121 Lackawanna Avenue. A second studio was located at 101 S. Main Avenue, in Hyde Park, Pennsylvania. To view other interesting beards, check out this site’s category of “Beards (Only the Best). 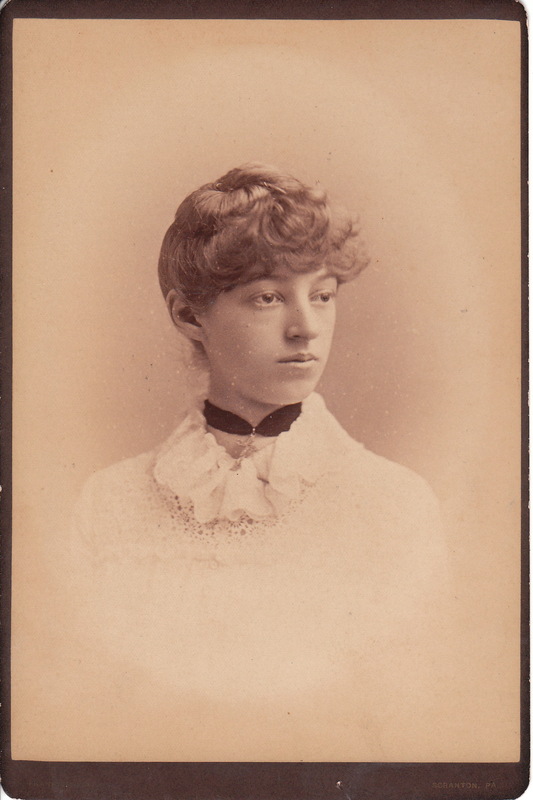 This cabinet card photograph captures a pretty young woman with an” interesting look”. Her hair is styled in a somewhat unusual manner. The photograph was taken by an unidentified photographer in Scranton, Pennsylvania.